In order to understand the flatMap() method, you first need to understand the map() function of Java 8. The map() function is declared in the java.util.stream.Stream class and uses to transform one Stream into another, for example, it can convert a stream of integer numbers into another stream of ints where each element is the square of the corresponding element in the source stream. In the map() operation, a function is applied to each element of the source Stream and return values are inserted into a new Stream which is returned to the caller. The key point to note here is that the function used by map() operation returns a single value. Now, if the map operation uses a function which instead of returning a single value returns a Stream of values like when you give a number and it returns all prime factors of the number then you have a Stream of Stream of integers. That's where flatmap function helps. 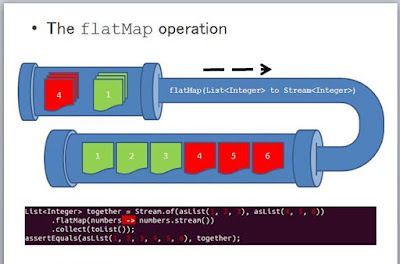 The flatMap() method can be used to flatten that stream into a Stream of integers. For example, suppose, you have a list of numbers like [21, 23, 42] and we call getPrimeFactors() method along with the map() operation to transform this stream. The result would be [[3,7],,[2,3,7]]. If you want to flatten this stream of a stream into a stream of values, you can use the flatMap() which will finally return [3,7,2,3,2,3,7]. In short, the flatMap() function is used to convert a Stream of Stream into a list of values. If you want to learn these functions better and in general Java better, I suggest you join a comprehensive course like The Complete Java MasterClass on Udemy, which is recently updated to cover Java 11. You can see that there are two lists, one is denoted with red color while other is denoted with green color, both of them contains three elements each. Once you apply flatMap on them, you can get another list which contains elements from them. You can see that in the second pipe where we have 3 elements from green lists denoted by 1, 2, and 3, and another three elements from red lists which is denoted by 4, 5, and 6. Btw, if you need hands-on online training to master functional programming in Java 8, consider joining Refactoring to Java 8 Streams and Lambdas Online Self- Study Workshop from Heinz Kabutz. He is a Java Champion and one other best Java instructor, many of you might have attended his Java Concurrency or Java Design pattern courses. Here is a sample Java program to demonstrate how to use the flatMap() function in Java 8. As I told, you can use the flatMap() to flatten a Stream of Stream of values into just a Stream of values. In our example, we have a Stream of the list of String and by using the flatMap() we convert this into just a Stream of String to get the full list of players participating in cricket world cup 2019. This operation is really useful to get the full list by combining several small lists. 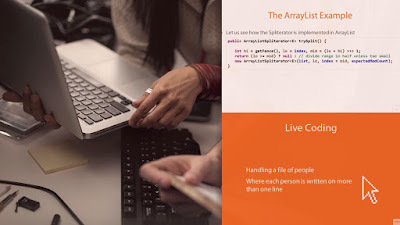 For more details, you can also join What's New in Java 8 on Pluralsight to learn new features of Java 8 like lambda expression, streams, new Date and Time API and other enhancements. Here is our Java program to demonstrate how to use the Stream.flatMap() in Java 8. * Java Program to demonstrate how to use the flatMap() function in Java 8. * just a Stream of values. This is also called flattening of stream. You can see that final list contains all the elements from each list. So flatMap() is working fine to flatten a Stream of List of String into just a Stream of String, that's the true power of flat map operation in Java 8. That's all about how to use the flatMap() function in Java 8. Just remember the difference between map() and flatMap() in Java 8 and when to use the map() vs flatMap(). If you use a function which returns a list of values in map() operation you get a Stream of Stream and by using flatMap you can convert that to Stream of values. In short, you can combine several small lists of values into a big list of values using flatMap(). It's called flatMap() because it flattens the Stream. > you can use the flatMap() which will return [3,7,2,3,2,3,7]. @Anonymous, yes, good spot though.